An interesting, if short, note on woeful state of global trade flows from Fitch (link here). 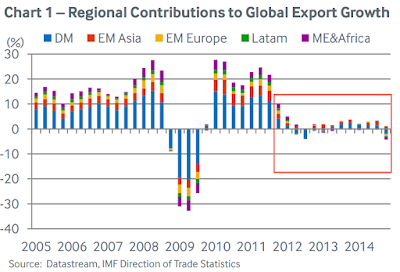 global trade remains severely compressed from mid-2011 forward. Most importantly, the rot is extremely broad - across all major regions, with no base support for trade flows. However, the EMs are just one part of the picture. Per Fitch, "Since 2012, global export volumes have consistently grown by less than 5%. Performance by value has been even worse due to the fall in global trade prices, again led lower by commodities. 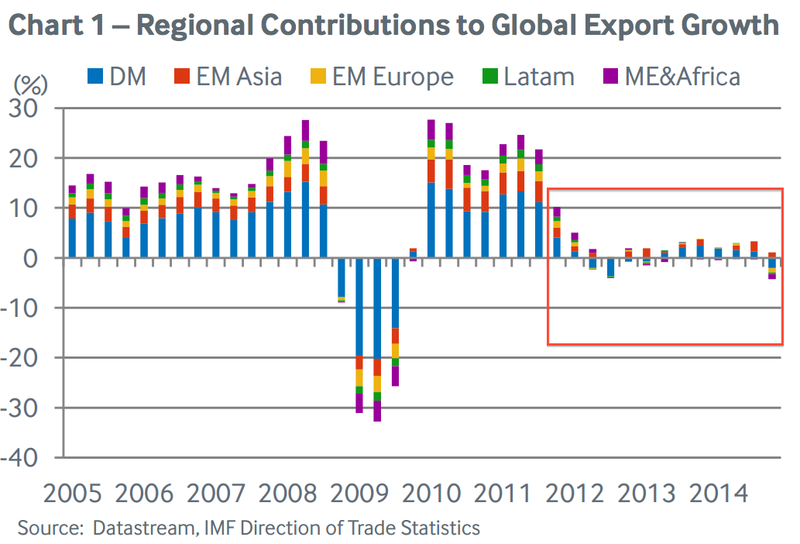 In April 2015, global export prices were down 16% year on year." Shift toward domestic growth in China - previously thought to be a catalyst for growth in trade via stimulating demand for imports - has had an opposite effect: Chinese producers and consumers are now increasingly sourcing goods and services internally. This was not predicted by the analysts, though I have been warning that this will be a natural outcome of the continued maturing of the Chinese economy away from producing low value added goods toward producing higher value added output. 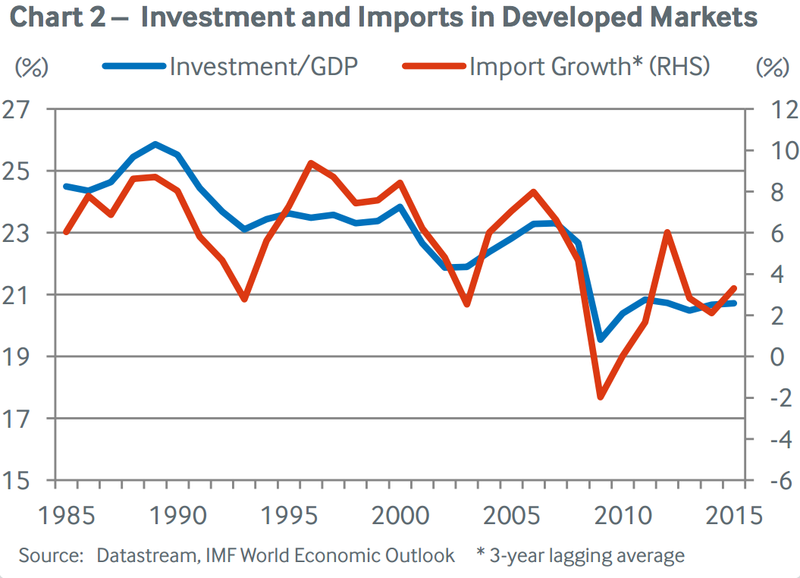 Thus, reliance of Chinese economy on capital and investment goods and services imports from Advanced Economies has declined. And we are witnessing an ongoing emergence of higher value added consumer goods manufacturing in China, which will further compress imports demands by Chinese markets. More significantly, over time, this will lead to even more complex regionalisation of trade, with trade flows becoming increasingly locked within the Asia-Pacific region, leaving more and more producers in the Advanced Economies facing an uncomfortable choice: shift production to the region or witness decline in imports demand. In line with this, there will be losses of jobs in the Advanced Economies and gains of activity in Asia-Pacific. 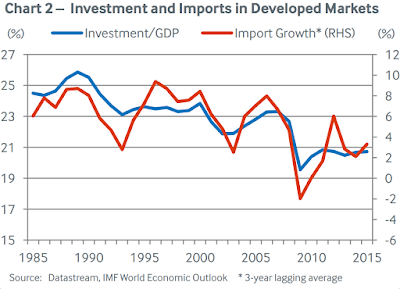 Fitch points to a policy driver for global trade slowdown: "According to the World Trade Organisation, the use of trade restrictions has been rising since the crisis and trade liberalisation initiatives have slowed relative to the 1990s. Together, these developments may be contributing at the margin to the reduction in elasticity of trade with respect to GDP." Nothing new here, as well. The world is amidst continued debt deflation cycle, with debt-linked protectionism on the rise. This is not just about currency wars, but also about financial repression and structural decline in overall growth. Fitch notes a third driver for trade decline: "There has been a change in the relative weights of domestic demand components, with investment falling compared with consumption and government spending… As investment spending is the most pro-cyclical and import-intensive component of domestic demand, a decline in investment tends to have a larger effect on trade." Again, I wrote before extensively on investment collapse in the Advanced Economies, and the fact that the main drivers for this are not a business cycle nor the Global Financial Crisis, but rather a structural decline in long-term growth (secular stagnation). You can read on this more here: http://trueeconomics.blogspot.ie/2015/07/7615-secular-stagnation-double-threat.html. Fitch note, while highlighting a really big theme continuing to unfold across the global economy, misses the real long-term drivers for the collapse of trade: the world is undergoing deleveraging cycle in terms of Government and private debt, reinforced by the structurally weaker growth environment on both demand and supply sides of the growth equation. The result is going to be much more painful that Fitch (and majority of analysts around) can foresee.